Food bloggers are really hard to satisfy. One eatery is never enough. After stuffing ourselves with dim sum at Hua Ting, we still wanted more - a sweet ending. So, off we went to Marmalade Pantry at nearby Palais Renaissance. It was a first for me, descending into the circular basement bistro. Surprisingly modest and cafe-like, this joint used to be the haunt of socialites. The tai-tais seem to have flocked elsewhere now. But I really don't mind. I relished the quietness the place provided. 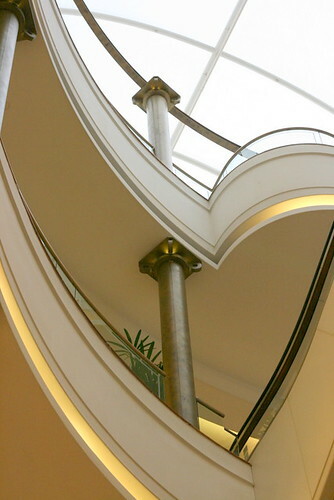 And looking up, I saw the lovely skylight and beautiful curves of the upscale mall - features easily missed if you are too engrossed in food or gossip. I must apologise upfront for the quality of the photos - I was too busy handling a cranky baby to take anything nice. In fact, I nearly abandoned this post. But a couple of things are quite noteworthy. The Chocolate Truffle Cake (S$7.80) was delightfully rich and light at the same time. Maybe because I only had one or two small bites. That's why it's good to share your calories! You'll enjoy your food more! 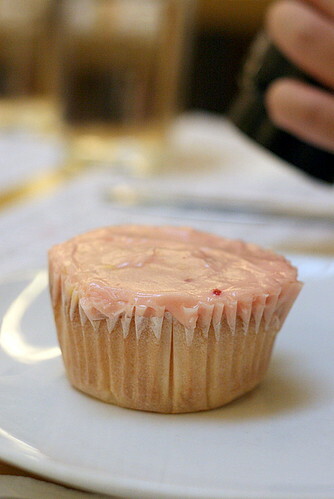 A Rose Cupcake - rose-petal flavoured cupcake with lychee and raspberry frosting ($4.20). Really sweet and feminine tasting thing. Macho guys would probably feel odd eating this. 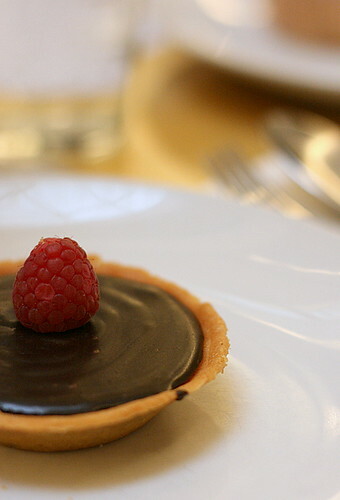 The Chocolate Tart (S$4.20) was not too sweet. 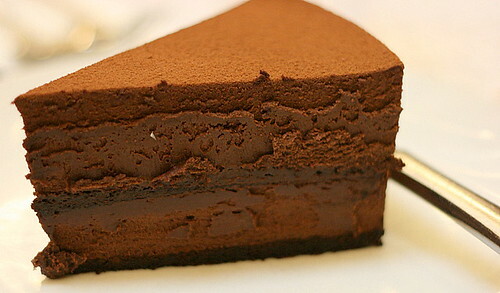 Can't say more as I'm not really fond of most chocolate desserts. 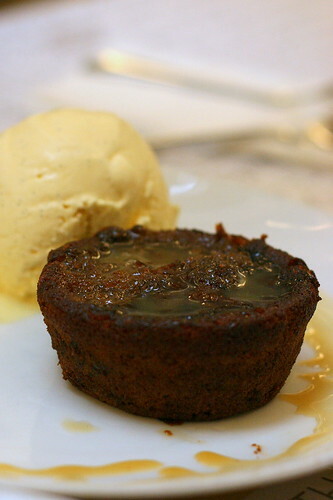 The much-vaunted Sticky Date Toffee Pudding with Vanilla Bean Ice Cream (a decadent S$12) failed to elicit any "Wow" from all six of us. The soft, spongy texture reminded us of some Malay kueh, but then maybe that's the way it's supposed to be. Personally for me, I'd expected it to be more dense and sticky. I mean, how many words in the name evoke that image - sticky? date? toffee? pudding? But well, I'm quite sure it's just a case of mismatched expectations. We all LOVED the ultra-creamy vanilla bean ice cream though. The real star of the show. Foie Gras Burger with Sundried Tomato Relish ($26). Nic kindly shared with us his burger. It looks charred but was pink inside. Most of us could not detect any foie gras in it, but I really didn't mind. 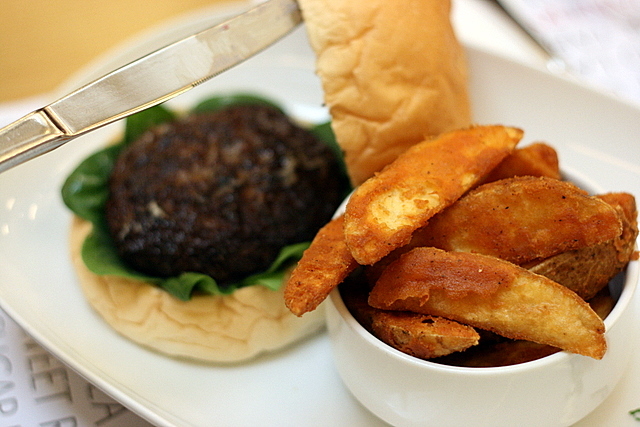 It tasted really beefy and juicy, and that alone for me, is what I love in a burger. The wedges too were very good. They stayed crispy despite the rounds of photography it had to endure. The other surprise was the sundried tomato relish - you can't see it in this photo but it was a jolt for the tastebuds. Was it infused with vodka? Something proved quite arresting in the tangy mix. I quite like this place. Things are a bit pricey (and prices have gone up in the past 4 years) but a few things are well worth the splurge. Service in general was friendly and pleasant. I'd come back to try some other stuff. Read the other opinions here! AromaCookery, Black Tie, White Lie, Bossacafez, HungryCow and Ladyironchef. I had lunch here once, about 2 years back and remembered it was good :) Never got chance to go back, coz they were always crowded till i gave up as i always forget to make a reservation. They are not so crowded now. =) But then again, we went well past the lunch hour. Only 3-4 tables occupied, including us. I had the sticky pudding almost a year ago.. It was very good then! Dense and really sticky (but not cloyingly so). Hmm, maybe it's time for a revisit. But definitely for the choc truffle this time! yeah the wedges were really good! i will definitely go back to try the other desserts, and cupcakes. yupe, the relish was good! i can still remember how it felt when i took a bite..haha! oh, and like you, i like sharing calories as well! hehehe.. The cake on the top looks delicious! Hi Kaelyn, glad you commented! Ah, I wish the sticky date pudding would go back to being dense and sticky! K-man: it's a trend, naming the dishes by ingredients, but makes it difficult for us to remember and type! I had to refer to the online menu.